The city of Jerusalem has had a long and turbulent history (a view of the scale model of the ancient city from c.66 CE at the Israel Museum at the left; photo © 2015 Donald H. Sanders; used with permission; hover over to enlarge). The details of its history are far too complex for summary discussion here (and there are many books that cover the subject from all sorts of points of view, with substantial supporting documentation, and providing analyses far beyond the scope or intention of this Website). Nevertheless, some introductory, albeit cursory, information can be given here as background to our reconstructions. The name Jerusalem seems to be a compound of two West Semitic (Canaanite) words yrw & šlim, which together could possibly mean “Foundation of (the god) Shalem” (or “Shalem is its founder”). Shalem in (14th-century BCE) Ugaritic texts is one of the two “beautiful and gracious gods,” Shahar (Dawn or Day) and Shalem (Twilight or Night). Eventually the name of that god became shortened to Salem in the Bible (Genesis 14:18 and Psalms 76:2). The marker below points to the center of the Old City of Jerusalem. For now, our visualizations focus on two periods in the history of the city: the Iron Age (c.1200 - 586 BCE) and the Roman Period (63 BCE - 330 CE). During the Iron Age, Jerusalem had apparently become the home and eventual capital of the biblical King David and his successors. When the Israelites came into Canaan they established a loose confederacy of clans or tribes led by charismatic leaders called "judges" and not ruled by kings or elected representatives. The center of the occupation moved uphill from the City of David hillside (excavation Area G from the City of David hillside excavations is shown at the left, with most of the remains from Iron Age inhabitation; photo courtesy of George Blumenthal; hover over to enlarge), but little of this era remains due to subsequent building campaigns. The first Temple was erected on the Temple Mount by Solomon in the 10th century BCE, supposedly on the ground where David had established an altar. 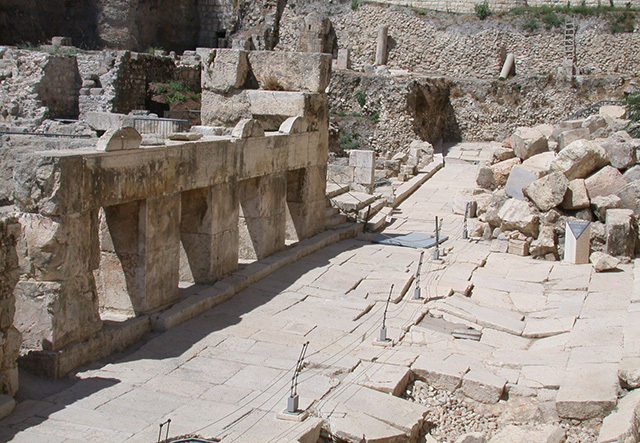 Defensive walls were built, and elaborate tunnels from the Gihon Spring (in the Kidron Valley, adjacent to and downslope from the Area G excavations) were also built to ensure that the growing city had continuous access to water, especially during waves of sieges. However, in 586 BCE, the city and first Temple are destroyed by the Babylonian king Nebuchadnezzer after a three-year siege. Large portions of the population were then sent into exile. Houses from this period excavated throughout the city show significant signs of fire. Jerusalem reached new grandeur under Herod the Great, a Roman-appointed local king, who ruled from 37-4 BCE. He embarked on a extensive building campaign all over Israel, but in Jerusalem he significantly changed the architecture of the city by vastly enlarging and embellishing the Temple Mount, designing a new Temple much more opulent and larger than any one previous, adding a sumptuous Palace and several villas, and reworking the fortification walls and entry gates to the city, as well as the streets inside the walls (one such Herodian street, bounded by shops, is visible in the image at the left; © 2003 Donald H. Sanders; used with permission; hover over to enlarge). A Jewish rebellion against Roman rule in 69 CE was decisively put down and the Romans burned and destroyed most of the city and the Temple in 70 CE in response. 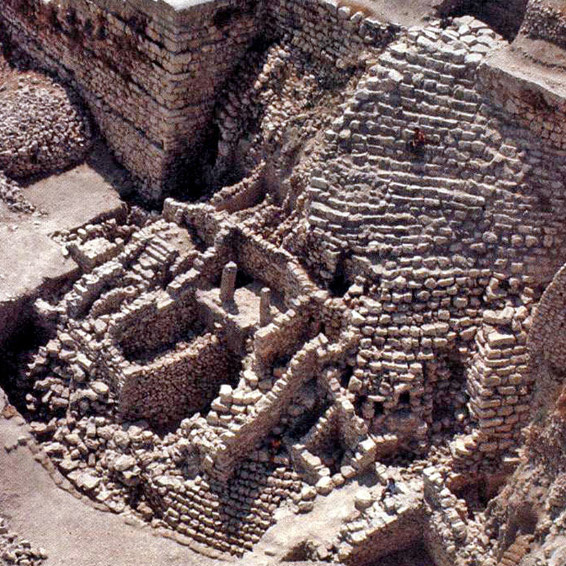 Excavations show that nearly all the city at this time became covered in burnt debris and tumbled walls (except for small portions of the Temple Mount and some areas of the western hill’s city wall). The city lay in ruins for nearly 60 years, until the Emperor Hadrian decided to rebuild it as a typical Roman colony city, renamed Aelia Capitolina, with colonnaded north-south main street, a grid plan, Roman temples, and the campsite of the 10th Roman Legion (it is this layout that can still be seen in the organization of the sectors and streets of the Old City). Our sister organization, the Institute for the Visualization of History, came to us to help visualize key monuments in and around the ancient city, for a massive online educational and research resource called Digging Jerusalem: gateway to history, the Bible, and beyond. The final module charts the history of the city and related locales from Antiquity through the establishment of the modern state of Israel. 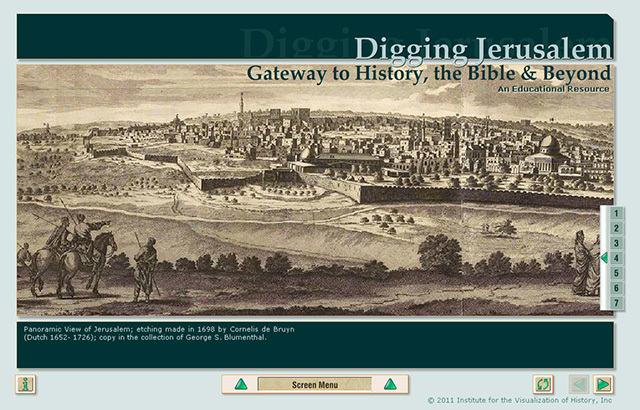 The online materials include, an excavation simulation game, high-resolution scans of 100s of key documents, interactive views and computer models of important artifacts and buildings, and stories, teaching tools, and descriptions about the past 5,000 years in and around Jerusalem. In this manner, globally dispersed ancient texts and artifacts can once again be viewed, studied, and taught together. On these pages, you will thus find our visualizations of several structures that were instrumental in the city's history.